Trifle is a staple at my family Christmas dinner; my aunty always making a traditional trifle with custard, swiss jam roll, jelly and peaches. YUM YUM! This year I have taken the traditional trifle and turned it into something so decadent and delicious you will be making this every year. Lucky I am typing this because I don’t think I would be able to say this with one breathe, but here goes…. This delicious trifle has 6 layers starting with raspberry jam swiss roll, soaked with Baileys Chocolat Luxe, topped with creamy vanilla bean creme patissiere, sprinkled with a layer of choc-coffee crunch, topped with Baileys Chocolat Luxe mousse, coated with generous amounts of seasonal berries floating in port wine jelly, finished off with Baileys Chocolat Luxe whipped cream, berries and chocolate shavings. Have I tempted you yet? If you are thinking “Ain’t nobody got time for that” then let me stop you right there. I made sure you can take a few cheat ways out if you are time conscious, Christmas is hectic after all! But for those of you who love making desserts from scratch, you can do that too. Cheat 1: Buy a jam swiss roll from your local grocery shop or bakery, they are delicious and no one will know you didn’t bake it. Cheat 2: Buy a good quality THICK custard from your local grocery shop to replace the creme patissiere. Thick is the key here, something like Pauls Premium Vanilla Bean Custard. Cheat 3: If you don’t have time to make the choc-coffee crunch simply use cocoa pops only, or some crushed chocolate biscuits. This will still add great texture to the dessert but you will just be missing that rich coffee/bitter element. Slice the jam swiss roll into about 2cm thick slices and layer into trifle bowl. Using a pastry brush, lightly soak jam swiss roll with Baileys Chocolat Luxe. Layer crème patissiere/custard over jam swiss roll and allow to set/cool. Sprinkle a thin layer of choc-coffee crumble over crème patissiere. Layer Baileys Chocolat Luxe mousse over the choc-coffee crumble and allow to set. Place a layer of seasonal fresh berries over the mousse. Once the jelly is made and has cooled but not set, pour over the mousse and fruit and allow to set. 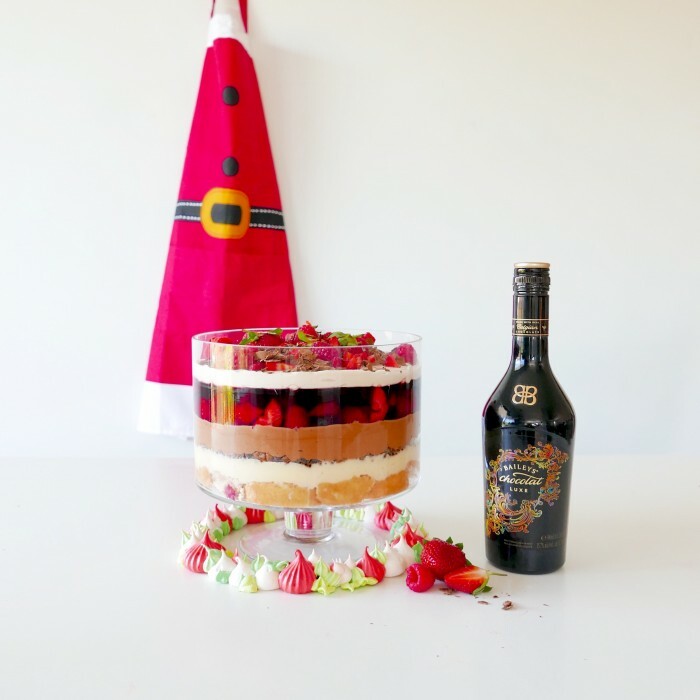 Layer whipped cream over the set jelly and top with fresh seasonal berries and shaved chocolate. 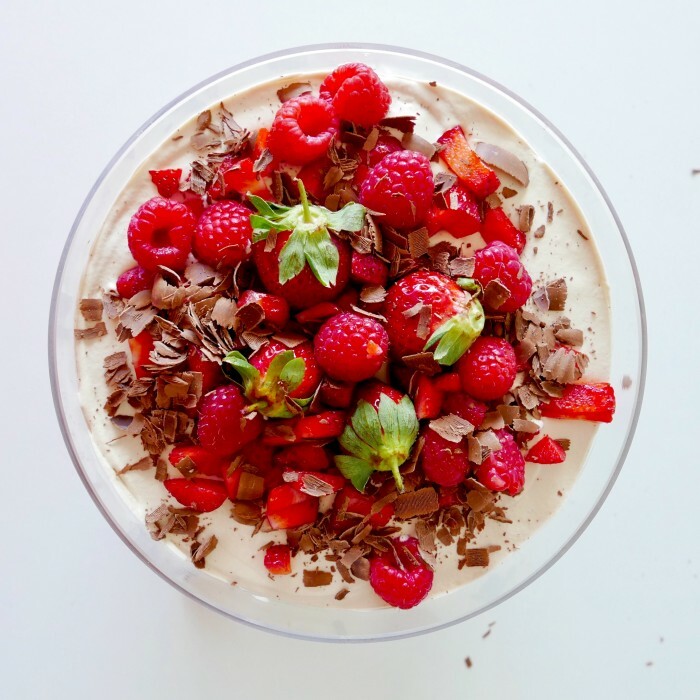 I hope you all go forth and create this delicious trifle and if you do, don’t forget to tag me in your photos. Wishing you a wonderful Christmas and safe and happy New year! Preheat oven to 180c. Line a 24x30cm swiss roll pan with baking paper. Beat egg yolks, sugar and vanilla until soft peaks form. In a separate bowl beat egg whites until soft peaks form. Fold the two egg mixtures together. Sift flour and nutmeg over the mixture and fold in until combined. Do not over mix. Pour mixture into lined pan and bake for 15 mins or until a skewer inserted into the centre comes out clean. Cover with a tea towel once removed from oven and cool for about half an hour. 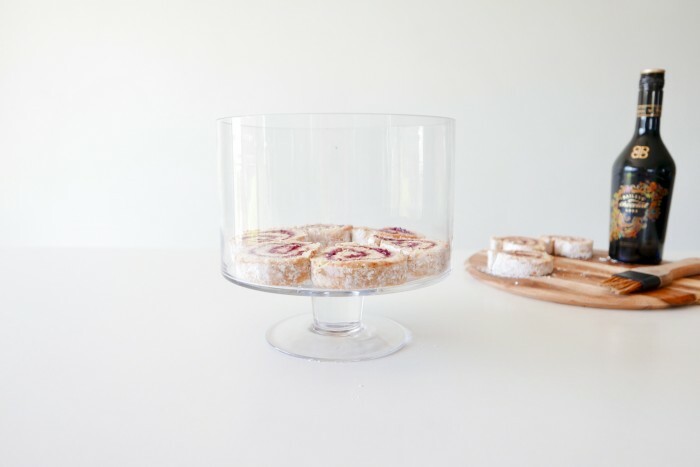 Lay a piece of baking paper on to the bench and dust with icing sugar. Flip your sponge out of the tin and onto the baking paper. Spread the jam over the sponge and roll in from the short edge. Once rolled wrap in cling wrap and store in the fridge until needed. For the crème patissiere, place egg yolk, cornflour and 30 grams of sugar into a small mixing bowl and whisk until combined. Place the milk, 30 grams of sugar and vanilla in a small saucepan over low-medium heat. Whisk mixture over heat until sugar has dissolved and mixture is hot but not boiling. Do not boil. Pour small quantities of the milk mixture into the egg yolk mixture whisking to combine. Continue until all of the milk mixture has been combined with the egg yolk mixture and place back into the saucepan over a low-medium heat. Continue whisking the mixture and it will eventually thicken, about 5 minutes. Remove from the heat and allow to cool slightly before layering over your sponge. TIP: do not wait too long to place the creme patissiere over the sponge as it will begin to set. Add all ingredients together in a bowl, combine well and set aside to cool. Melt chocolate in the microwave in 30second bursts until completely melted. Set aside to cool. In a stand mixer, whip cream and baileys until stiff peaks form and set aside. In a stand mixer, place eggs and sugar and beat on high until soft peaks form. Add cooled chocolate and mix until combined. Fold in whipped cream to chocolate mixture. 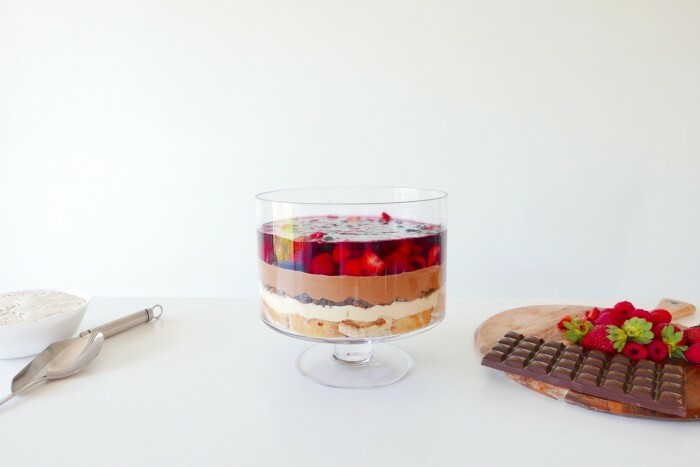 Layer into trifle on top of the choc-coffee crunch. Follow directions on the package, makes 500ml. Set aside to cool. Slice berries and place on top of the set mousse layer. Pour the cooled port wine jelly over the berries and allow to set in the fridge. Add all ingredients into a mixing bowl and beat until soft peaks form. To make the chocolate shavings use the edge of a steel cookie cutter/piping tip to shave chocolate off the flat side of a block of chocolate. See video for how to.